Huntley’s Hounds came about when I wanted to find someone to care for my animals the same way I do. I wanted to find a person who truly watched them, and got to know them. I wanted much more than an average dog walker and house sitter. I was looking for real care; someone who was aware of my pet’s personal habits, and who would notice if things had changed. I wanted someone with years of experience and a wide range of knowledge about animals and their behavior and health. If anything was unusual or had changed with my pets, I expected a care taker to take notice, and tell me. What I found most often, was people walking our dogs with other clients’ dogs at the same time, while talking on cell phones, and rushing in and out to get to the next client. There was no real knowledge of the pets in their charge. I wanted more personal, individual, well experienced attention for my animals. I found that level of care was not readily available - we made it available through Huntley’s Hounds. ; those huge bundles of furry love lay under my crib and guarded me from everyone, sometimes they wouldn't even let my own Mother near me. So for me, my first experience with dogs was one of them keeping me safe. From then on it’s simply been second nature to me, and my life’s passion to keep them, and their kind safe, well cared for, and protected in return. I don’t recall a time I didn’t have a dog in my arms, lap, bed, or at my side. Dogs for me are pure unconditional love, and they deserve as close as we humans can give them in return. is mostly focused on my pup Ziggy. I’ve lived with and cared for many different animals: horses, sheep, a pair of lost chickens, several stray cats, orphaned bunnies, raccoons and possums, one little fawn, three turtles from the nearby skating pond, many wild baby birds, lots of wild lizards, dozens of fish, and a most incredible hawk. My poor Mother never knew what sick, injured, abandoned creature I’d bring home to save. Some days I’m sure she didn’t even want me to go out to play, as she knew I’d bring some needy little soul home with me. Every one of those animals showed me how to use and find great compassion, patience and joy. They taught me about love and sacrifice; sadly also about death and loss. My experience in helping those little beings heal (or their not making it) is where I learned some of life’s most important lessons. I’ve loved every creature I ever brought home, and I learned a great deal about every species in my care, but even as a child it was always dogs that really held my heart. My personal experience with, and love for animals has literally been lifelong. Professionally, I’ve been in domestic pet care in the Los Angeles for 19 years. I’ve volunteered for, and worked with, some of the finest dog rescues in the LA area for the past 19 years as well. 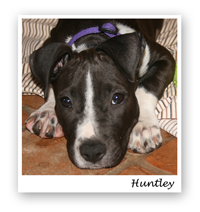 Being able to rehabilitate dogs, such as our business’s name sake Huntley, is a treasured gift to my life. I want to share that with more than one angel at a time. It is time for me to go back to giving our great care and personal attention to several area pets; it is time for Huntley’s Hounds to share again.